Ah, WH-Community. Somehow I missed the update. Well, that changes things! Although I won't be using him for BSF, but with 40K rules it wouldn't be too hard to mod him for Kill Team. It really surprises me that GW aren't including rules for use in Kill Team in this expansion. It seems like an obvious choice. Absolutely. He'd make for a team-vs-monster, like an Imperial Guard team trying to kill a Broodlord. It would make for a cracking White Dwarf article! With Rules for Warhammer 40,000! The return of the Ambull is a pretty big deal, and it’d be a shame to restrict how you could use such an awesome model. So, inside The Dreaded Ambull set you’ll find datasheets for using this massive beast – and the scurrying critters that accompany it – in battle, plus points if that’s how you like to balance your games. Yes, that is how I like to (attempt to) balance my games! Can't wait to see how this thing works in 40K too. If the Ambull is unaligned, he could make a pretty interesting choice for a number of armies. "They have a dreaded Ambull." Tempted to splash out on the carry case. Haven’t any spare at the moment, and my BSF models are currently in an old biccie tin. It's weird it didn't come out with the main game. There's also no indication about what's special about this case. Can it properly fit all the cards/tiles for the main game + the expension, or is it just a small case with special branding (like for KT)? I have the Feldherr foam specifically made for Blackstone, which is pretty nice (and I know Battlefoam makes something similar). Sadly I'll have to store the Ambull separately. The description says nothing about the components - it’s just for ministures. Like the one they did for Kill Team but bigger. It is nice of them to throw a bone to the more fringe elements of the player base. It was always a future project of mine to buy an OG Ambull and field it as a Clawed Fiend, but I could never find one for the right price. Perhaps now I will not have to. For WHQ players, that's not the worst: it looks like it comes with a lot of content. For just 40k, yeah, that's pretty nasty. It doesn't look that impressively large to justify the model price. Umm, it's a really common board game expansion format, to have a new central baddie and ways of using it both in standard games and with scenarios. On the miniatures side of things, Malifaux occasionally releases boxed sets that, starter set or no, have a bit more fluff and some scenarios besides competitive play, and Infinity has been doing character trios and special scenarios for a long time. It's definitely a pretty common board game expansion type. I wouldn't be surprised if we also see expansions that add several new playable characters and some mission stuff at some point. My issue is with the prince. $60 is too high for an expansion that adds a bad guy and a handful of cards. 2 bad guys, but yes, $45-50 would be a lot more reasonable. Personally, I'd have preferred something more in the $60 range that was the current content and a new hero. Good point - it would have been easier to deal with if it had a few more miniatures in it, especially if one of them was a new hero/playable character. Knowing GW, it is more that one of the next expansions will be worth $60 and they are standardizing the expansion price against that, rather than this one being valued appropriately. It's like how the KT Commanders were all $35, even though some commanders were worth more individually and some were worth less (and some were worth way less). They may sell the models separately at a later date, possibly a candidate for Necromunda? Doesn't that game have rules and guidelines for alien creatures? How does it compare size-wise to the new troll or dreadnoughts? Those are $60-65 or so, single model in a box. Efficiency is the highest virtue. Looking at the sector mechanicus terrain in the background of one of the pics from WHC it looks to be comparable in height to a SM boxnought. The big game hunter is a great idea! Hmm, at $60 retail, that might be something to splurge on with an ebay coupon. Maybe if I end up loving the game I'll grab it, but it's a bit spendy for me. I wouldn’t say one of those is more common than the other there..
I’ve bought plenty of expansions that are a single baddie and it’s scenarios (likewise character lacks with new scenarios). While yes this is more expensive than those, I’d say it’s in line with GW, where their ‘board game prices’ are more, at the £100 mark. 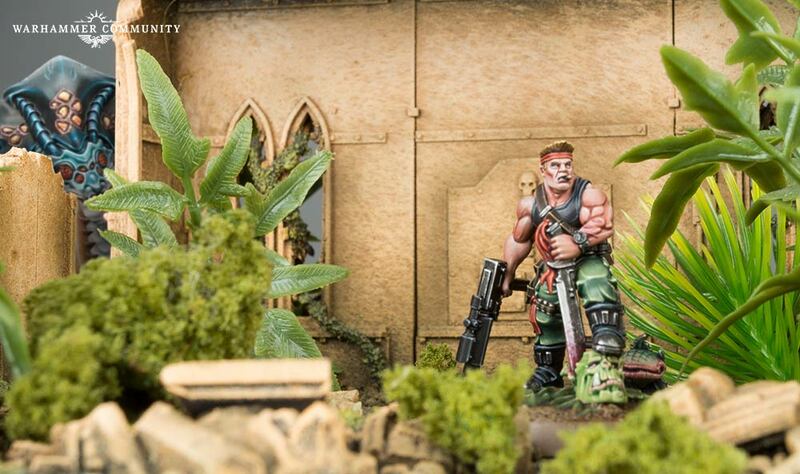 Sly Marbo stalks an Ambull through a death world forest (the poor creature!). That is a priceless picture - its evening hiding from him! Glad to know that the Ambull is hostile to even Tyranids...very interesting indeed!